Am I too young to think about retirement? Starting young has given 27-year old Dan more confidence and opportunities to attain a comfortable retirement. At 27, retirement is the last thing on Dan’s mind. Recently married, his immediate priorities are buying a house, having children, and ensuring the success of his family business, which is his only source of income. Financially, Dan is stable with a healthy net positive cash flow of about S$2,500 per month after expenses. He has a savings of S$50,000 to delve into in case of emergencies and has insurance coverage for life, death, critical illness and hospitalisation. Additionally, his parents had signed him up for an endowment plan that would contribute an additional S$12,000 upon maturity in 20 years. Dan is a classic example of why some young adults leave retirement planning until it is too late. With immediate financial priorities such as buying a car or a house, retirement often takes a backseat. The reality is that it’s just a matter of time before he has to plan for the bigger goals like his children’s education. The earlier he starts, the smaller the amount he needs to set aside. If Dan waits too long, the lump sum or monthly amount required to invest becomes larger and larger, and depending on his financial scenario, it may not be feasible, forcing him to settle for a less ideal retirement. The best scenario is to start earlier with a smaller sum, and let compound interest take over. The key to good retirement planning is having a rough target in mind. Dan is likely to live for an average of 15 - 20 years after 65. This is a long time, and people tend to underestimate how much they would need after taking inflation into account. 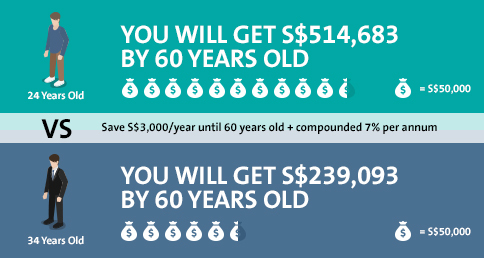 CPF Life will guarantee Dan a monthly income of between S$1,200 - S$1,400 throughout his retirement, and this is the foundation on which to build on for a comfortable retirement. Dan went through the OCBC Life Goals programme with Eric, an OCBC Personal Financial Consultant, to understand how his short-term goals impact his retirement. Going through the retirement calculator with Eric, Dan was shocked to find that he has a shortfall of about S$900,000 to make up for his retirement. However, with smart planning, the target is within reach. Unknowingly, Dan has the basics of manage and safeguard locked down. These include being cash flow positive, having an emergency fund of 3 months of his monthly expenses set aside, and protecting himself, his family, and his assets from unexpected risks, enabling him to focus on growing his retirement fund. Unusual for his age, he had a conservative investment approach, hindering his ability to make up his retirement shortfall. His parents had gone through a bad experience where they lost a lot of money in the stock market. With this mind set, he prefers staying liquid, a firm follower of the “cash is king” stream of thought. As such, Dan has a fixed mind-set that all equity-related products are inherently risky and should be avoided. 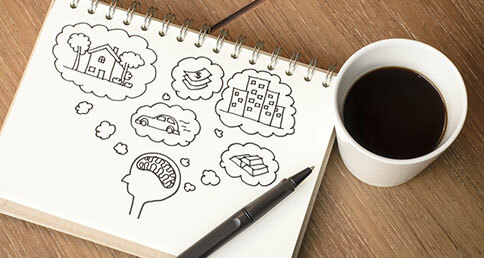 However, the reality is that while equities themselves offer higher risk and reward, other equity-related products such as unit trusts and exchange traded funds provide income and growth opportunities while balancing the risks by virtue of being part of a larger portfolio of equities, bonds and other asset class products. As Dan is young, he can look at unit trust options as part of his portfolio. Another misconception that Dan had was that insurance was only for protection. However, there are insurance products such as endowment plans that can be viable investment alternatives for a balanced portfolio. For Dan’s case, he has the opportunity to avail of compounded interest for a period of 30 years or more, which would give him a big pay-out upon maturity. If you are interested in OCBC Life Goals, please refer www.ocbc.com/lifegoals. The document is for general information only and it does not take into account your particular investment and protection aims, financial situation or needs. Before you make any investment, you should speak to a financial adviser who will assess whether the products are suitable for you based on your investment objectives, financial situation or needs. If you choose not to get advice from a financial adviser, you should consider whether the products recommended are suitable for you. This document is not a contract of insurance. It does not constitute an offer to buy an insurance product or service. It is also not intended to provide any insurance or financial advice. The specific terms and conditions of the plan are set out in the policy documents. A person interested in the insurance policies should read the product summary and benefit illustration (available from OCBC Bank) before deciding whether to buy the product. Potential investors of any funds should read the relevant prospectus for details on the relevant fund before deciding whether to subscribe for, or purchase units in the fund. A copy of the prospectus of a relevant fund may be obtained from the relevant fund manager or any of its approved distributors. The value of the units in the funds and the income accruing the units, if any, may fall or rise. Please refer to the relevant prospectus of the relevant fund for the name of the fund manager and the investment objectives of the funds.